Panel Discussion: Social Media 2011...Where is it Headed? What can we expect to see in 2011 in the realm of social media and marketing? Join our panel of social media experts for a lively presentation and debate on their predictions for social media trends for marketers. Of the now overwhelming number of choices for tools, programs and strategies, which ones might “make the cut” and help marketing realize tangible ROI? Which ones might seem like a distant memory when we look back at this latest technology revolution? Have you started to incorporate video into your marketing mix? It's one of the most powerful and compelling ways to reach a wide audience and developing great content doesn't have to break the bank. In this webinar, Charlie DeBenedittis of CarpeVM (http://www.carpevm.com), will share with you best practices and case studies so you can get started with online video marketing. In this hour-long webinar, you'll learn how to use social media tools to help you network and generate demand and attention offline, aka "in the real world," for yourself or your business. The webinar includes a "social media marketing makeover toolkit" with a simple checklist for making sure you're effectively using all of the latest tools. The old world of business is no guarantee of success in a reinvented world. Innovation in the new world of business requires new rules and a different playbook. Good news? Most large organizations have what they need to tap this power, but may be looking at the wrong things in the wrong places. Join Dee McCrorey, innovation catalyst and author of Innovation in a Reinvented World (Wiley, Oct ’11) as she highlights 10 essential elements for business and career success in this new reality. Social media success is often measured with classic commercial metrics – conversions, sales. How can social media be effectively used to build community for a public service Corporate Social Responsibility project? Join marketing consultant, Catherine Shinners as she shares practices and tactics she used for a Cisco public service project. Social media was used to effectively engage education leaders in conversation and outreach and to draw them in to join, engage and participate in an online community. She’ll share strategies, tactics and a way of looking at success metrics for public service projects. Rob Sanders, president of SEO firm RSO Consulting, will talk about "Best Practices for Optimizing Your Blog" in order to help increase/improve your search rankings. Join Lou Dubois, Executive Editor at Social Media Today and a contributing writer to Inc. magazine, with his special guest Bradley Shear, Attorney and Blogger (Shear on Social Media Law), as they talk about how to set up a social media strategy to mitigate the risk of a social media lawsuit and what to do in the event that you or your company is hit with a one. As we now know, in light of the recent Facebook lawsuit, nobody is immune so everyone needs to be prepared! Join marketing and technology guru Bill Carmody as he shares tips, tricks and real world examples for integration social media, into your online promotion marketing mix. For 17 years, Bill has focused on integrating wireless, online, sponsorship, events and traditional disciplines and he’s been instrumental in the development of new products for Internet promotions including instant win, contest, and sweepstakes game engines. Don’t miss this exciting event! Join author Pamela Lund as she introduces, discusses, and opens to debate her new book Massively Networked. This is not just another book on social media; it gets to the heart of surprising changes that are rattling assumptions about health, work, the home environment, politics, the economy, and our place in the global ecosystem. Visit massivelynetworked.com to learn more. What is the ideal profile for a senior-level marketer in 2010? How do you find a “seasoned” executive with social media skills when social media has only existed as a marketing tool for a short time? This webinar will discuss the issues surrounding identifying hiring senior-level marketers with relevant and tangible social media skills. In this hour-long webinar, you'll learn how to use social media tools to help you network and generate demand offline, aka "in the real world." The webinar includes a "social media marketing makeover toolkit" with a simple checklist for making sure you're effectively using all of the latest tools. About the presenter: Sharon Schanzer is a principal and the CMO of MJS Executive Search, a boutique retained executive search firm based in New York. MJS Executive Search (mjsearch.com) specializes in marketing, social media and sales searches and clients include Pepsi, Applebee's, American Express and Equinox Fitness. 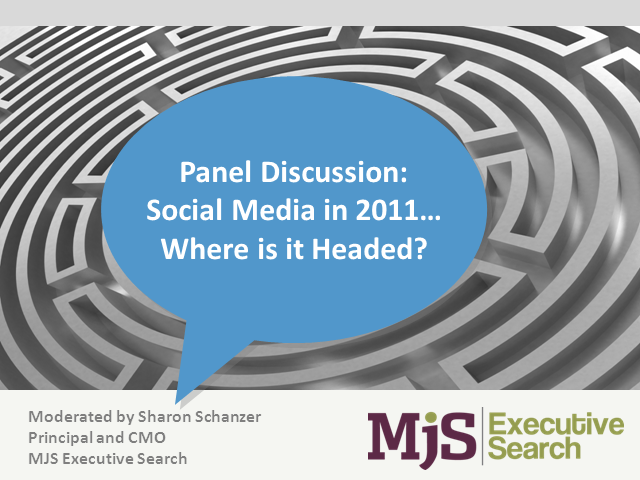 Connect with MJS Executive search on Twitter at @mjsearch and with Sharon at @nycsfmaven or via Linkedin at http://www.linkedin.com/in/mjsearch or http://www.linkedin.com/in/sharonschanzer. Social media, marketing, sales, time management, talent management...everything a busy senior-level marketer needs to know to get things done in the busy busy world we now live in. Title: Panel Discussion: Social Media 2011...Where is it Headed?